Kade Sharkey, a junior majoring in economics and international studies, spent 15 days in July shadowing top executives of Shanghai Tianan in China. Shanghai Tianan is a textile company seeking to expand operations, and Sharkey was there learning the “anatomy of international commerce.” Part of his lessons included visiting 15 factories in six cities, along with attending trade shows. 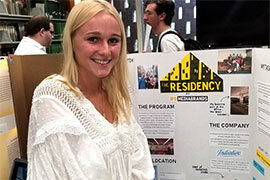 Sharkey and Benson were two of 20 students who exhibited posters and presented their experiences to fellow students as part of Stetson’s Internship Showcase, Nov. 2 at the duPont-Ball Library on campus. 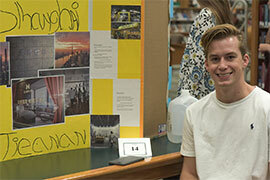 A total of 95 students attended to view the exhibits, which also were judged by eight faculty members. 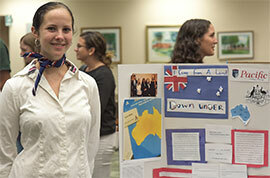 Stetson’s Internship Showcase featured 20 student exhibitors and 95 student attendees at the duPont-Ball Library on campus. ‘It gave me the opportunity to almost piece together the puzzle,” he added. “When I go out and shop for these products, it never once clicks in my head the process it takes to actually get the product from point A to point B to point C, which is being available to all consumers. James Aagaard also took a bite out of the Big Apple during seven weeks over the summer. A junior majoring in organ performance, Aagaard performed music for Sunday morning worship services, labeling it “an amazing experience.” Also, he was able to peer behind the curtains at rehearsals and planning sessions, while helping to organize the church’s music library. Notably, he made initial contact with the church when its music director gave an organ concert at Stetson when Aagaard was a first-year student. “My organ instructor [at Stetson] is great. I learn a lot of things. … But what I did here is specifically leading the congregation into things, which is ultimately very applicable to what I’ll be doing as a career,” Aagaard said. Kaitlyn Miller trekked all the way to Sydney, Australia, and returned home three months later with newfound passion for a career in human resources. The senior communications major interned at Pacific Training Group, which provides vocational education and training in hospitality, event management, leadership and management, and travel and tourism. “I really felt comfortable and confident in my field, and that’s something I strive for other people to experience, so they know their education is going toward their career,” Miller said. Such words hit home with Tatiana Izquierdo, a first-semester student from Orlando who is majoring in business but exploring her options.